There is a lot of talk of cleanses and detoxing these days, but not all detoxes are safe and effective. Some may clean out your downstream systems (bowels and kidneys) and may make you feel better temporarily if your diet has been less than ideal. Some are downright difficult to do because they required you to eat a starvation type diet and live off disgusting green juices or maple syrup, lemon juice, and cayenne pepper. Other types of detoxing may dump too many toxins into your overwhelmed system and make you feel worse! A detoxing program that actually can help you rid yourself of heavy metals and other environmental toxins should not require yucky drinks, leave you starving or lacking energy! Instead, a real detox should teach you how to clean up your diet while nourishing your system so that real detoxing can happen. This is what the True Cellular Detox™ program does; It teaches you to discover the root cause of your health issues and fix it at a cellular level for lasting results. While many of my clients come to me for weight loss, everyone has underlying physical issues – high blood pressure, high glucose, thyroid dysfunction, autoimmune conditions and more. If you have weight to lose, then you will lose weight by learning to eat what’s right for your body. One person’s medicine is another person’s poison. If you don’t have weight to lose, you will not starve. What will happen is that you will reduce inflammation and every single one of my clients who follows through with my recommendations is able to reduce their medications, and in many cases eliminate them all together! 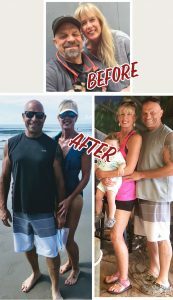 This is not a weight loss program per se but it will help you lose weight if you’ve been struggling with weight loss resistance and are holding onto excess weight due to inflammation. Your body is designed to heal itself given the proper fuel and nutritional and emotional support tools. I am here for accountability and to help you learn how to heal yourself. I look forward to supporting you on your wellness journey! Please contact me for a compliementary consultation!